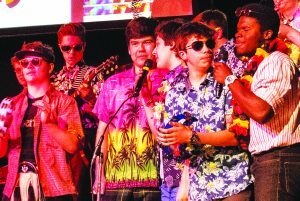 PRIZEWINNING singers in Hawaiian shirts made a colourful splash on stage at the HG Wells Centre in Woking last week. The Grade 6 band were singing a number that was the winning entry in Gordon’s School’s inter-house music competition. They and their group performed KC & the Sunshine Band’s Give it Up as part of the school’s spring concert, Songs for all Seasons.